Well, after yesterday’s “ugly” post, I felt I had to do something to redeem myself. 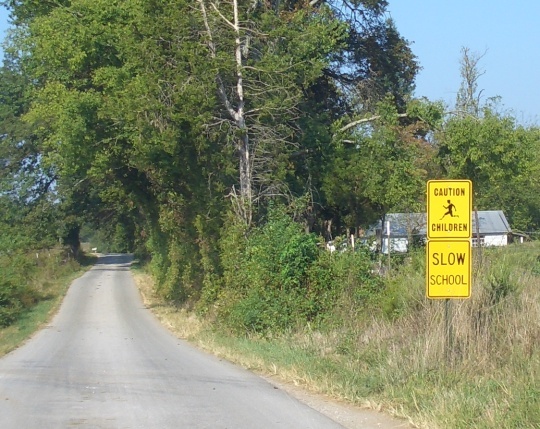 So I hope you enjoy these shots of an Amish settlement in Hardin County, Kentucky, taken last year on a beautiful summer day (note: this first photo is not an Amish place, but is from a nearby town; all the rest are Amish). Red barns, and a question for Erik. Good morning Erik. 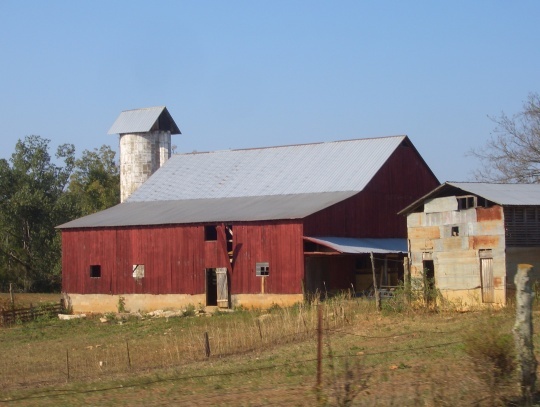 I have always loved images of red barns, so i see that you have included a few in your post. What strikes me at least from looking at these pictures is the economic contrast between say Lancaster’s Amish and what’s in these pictures. 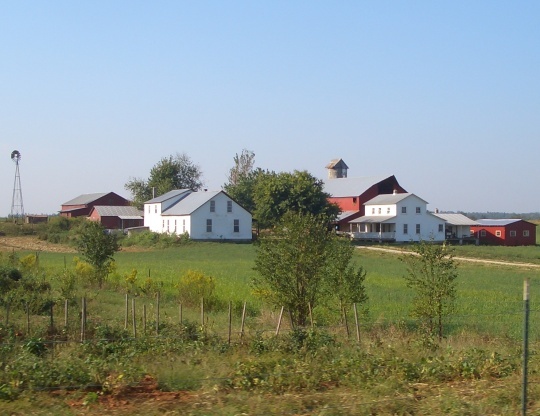 maybe its not fair for me making that judgment call on only these pictures, because I’ve never been to Kentucky and I’ve heard its very beautiful including its Amish settlements. And i was wondering Erik if you have ever asked those who are Amish in say the southern states what their thoughts were about the Amish who live in Ohio and Pennsylvania?, do they think they went too commercial with too much contact with us (the English)?. Everyone have a very nice day. Richard from Lebanon county’s Amish community. Glad you enjoy them Lois! Richard that is a good question. Actually it’s funny but some settlements in the South are fairly economically tied in with English. 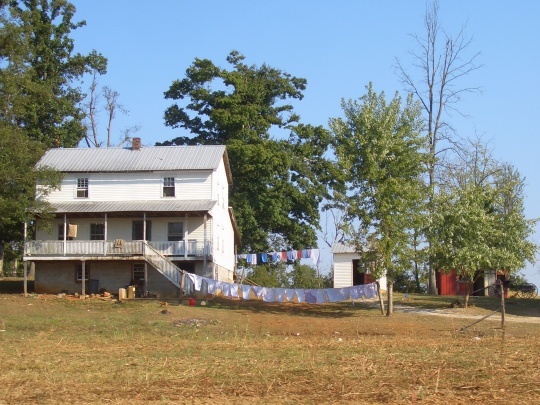 When I visited the Swartzentruber Amish settlement at Ethridge, Tennessee, I was surprised to see how involved with tourists they were, even to the extent of welcoming tours onto their farms and into their many businesses. There is a tourist map featuring many Ethridge Amish businesses, along with huge horse-drawn tour wagons that make the rounds of Amish farms. Ethridge is a very conservative affiliation of Amish. So intuitively you would generally not expect to see this level of interaction of highly conservative Amish with outsiders. But it seems to happen at Ethridge. Of course economically they still aren’t going to be near Lancaster or some of the Amish in Holmes County for instance. Lancaster Amish a different breed? Richard, a little more on your question–typically, when you ask Amish from other communities about Lancaster Amish, they have a specific point of view. You usually hear Lancaster Amish described as very driven, hard-working, and quite focused on making money (which you could say is driven by necessity as you know how expensive Lancaster is). I’ve heard some non-Amish describe Lancaster Amish as rude, but I also recall hearing on a number of occasions about how hospitable they are, from both Midwestern Amish and non-Amish people (I should add, I would definitely take the latter view–highly hospitable folks–though I can understand if Amish living in the heavy tourist areas were a bit prickly at times). Lancaster people are to some extent seen as a “different breed” particularly by Amish folks in the Midwest. And in a sense they are–they primarily descend from a different set of families (some PA Amish did end up in the Midwest, but a lot of the Midwestern Amish come from a different wave of 19th-century immigration), have different last names, dress, buggies, and some different customs. are from a Swartzentruber settlement. I’ve been to Swartz. rather than from more lucrative jobs in factories. Hi Al, the Pepsi sign is definitely not an Amish store…I hope that would be clear but maybe I should add a note (since this post is titled “Hardin County…” and non “Hardin County Amish…” I thought I’d be able to get one non-Amish photo in there 🙂 ). This was in the town on the way in to the settlement, and I had to snap a shot–I love this kind of Americana imagery. But yes Amish would never have this patriotic type of display, however, as you probably know some Amish crafts shops in larger settlements definitely sell things that they generally wouldn’t use or display in their own homes. I’m thinking of things like decorative barn stars for instance. I believe it might have been Sonora, but not sure. Very small town. Al, good points. Swartzentruber Amish emphasize plainness and could even be said to discourage accumulating a lot of wealth. Their technological restrictions definitely make that harder to do; businesses are a lot more limited than your average Amish shop would be. They also tend to be in lower value-added ends of industries like sawmills rather than custom furniture design. Some Swartzentruber Amish survive on what we would consider incredibly low incomes. If anyone’s interested in Swartzentruber Amish, An Amish Paradox is an excellent and up-do-date book on Swartzentrubers in Ohio. New York Amish goes into some depth on Swartzentrubers as well. Thanks for answering my question Erik in a clear way , its a question that I’ve wanted to ask for awhile now. Your almost out of the woods from yesterdays post,lol. So your on the road to redemption. I’ve better get going now, enjoy folks. Richard. The Lancaster Amish are only rude to some tourist people, those who stand right in front of them with their camera and get in the way of the Amish living their normal life. Been very busy here the last few days. Finally got something up on my blog about Frank’s birthday. Actually I made another video, filled with pictures of the day including opening cards. Thanks again to everyone who sent cards. I believe the most cards came from you wonderful folks here on Amish America. Yes Mona, he got your’s and your granddaughter’s card. It is quite lovely, thank you! Frank had the biopsy yesterday, it seemed to go OK but we will not have results until May 2nd. Please keep him in your prayers, its not cancer. He certainly has enough to deal with, with his heart condition. Thank you Erik for letting me throw in a bit of my personal life on here. You are so kind!! Kentucky is rich in American past. Here one can locate numerous small towns with buildings still standing long after their prime. When driving through small towns one can seem to transport back in time nearly 100 years, (except when you meet a brand new car passing by in the other lane) I understand that this is the case in many areas of the country and I for one enjoy these small trips through America antiquities. Perhaps this is one of the reasons I enjoy Amish culture as well. When I was living in Germany I could stop and stare at structures for hours if they were hundreds of years old. I forgot to add something, sorry for consecutive postings, but Erik I have some photos of the Crab Orchard Amish settlement in Kentucky,(taken recently) it is the one in Lincoln County Kentucky and is small only consisting of 4 church districts, if you would like I could send them to you via email if you want to add to your collection. decor. You did explain it clearly (that it wasn’t an Amish store)in your narrative by the pictures and I apologize for not reading it better before I wrote. I sort of wanted to clarify though, because I know Amish life is changing and I do now sometimes see patriotic decor things for sale in Amish stores, but haven’t seen any yet in any Swartz. 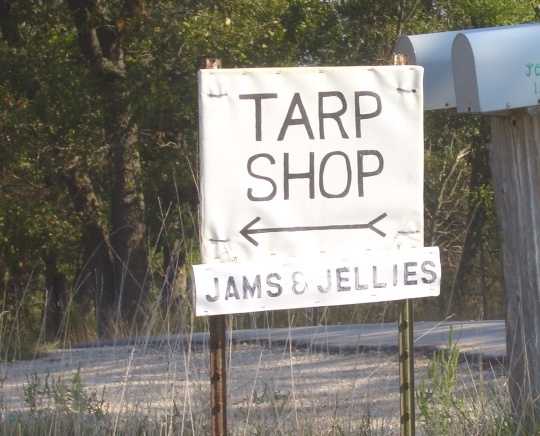 Amish stores. No worries Al, actually you didn’t misread at all–in my response to you I mentioned I might add that note, and that’s what I ended up doing, just to clear up any confusion, so thanks for bringing it up. But it’s good you asked b/c as you said you do see some items for sale that you wouldn’t expect in an Amish home. Tom, I can relate about America’s small towns–love to spend time in them as well and soak up the history. On the Crab Orchard photos, would be happy to see them, and if you don’t mind sending them the best address is ewesner@gmail.com . Thanks! Alice, glad to hear the possibly good news about Frank and will be sure to check out your blog. Great to hear he got so many cards! Erik, we do not know if it is good news or not, just that he got through the biopsy without excessive bleeding or complications. We won’t know if it is cancer until May 2nd. But thanks!! As always I enjoy the great photos; I see I am not the only one that enjoys red barns. One of your readers was kind enough to send me some photos of her barns. Great idea to take a photo of the old pepsi sign. I love these old signs. I love small towns; hope to move to one this year. Went down to Costco this afternoon in Lancaster, and what had started out to be a partly chilly sunny day ended up to be a sometimes rainy and cloudy one. Happy Easter to you Erik and everyone on Amish America. Richard from the Amish settlement of Lebanon Pa. 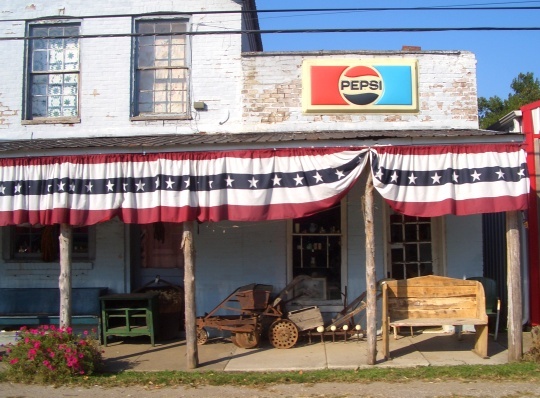 The “Pepsi Store” looks like a western movie shot or something one might have seen in early photography around the time of the US Civil War. Could have been except for the sign and maybe the bench seating. Is there a celebration that warrants the stars and stripes bunting this time of year? Erik, could you clarify what that “Conestoga wagon”-looking vehicle (with rubber tires?!) is, and what it’s used for? I’m intrigued! Alice Mary, I was waiting for someone to ask! Shom this was actually taken last summer in September; I didn’t study it but just had the impression it was part of the decor of the place. I live just outside of Sonora – that is where the “Pepsi Store” is indeed located. The town festival “Sonora Days” is held at the end of August each year – the bunting was still up from that. (Though buildings in the town often have patriotic displays throughout the year). Excellent Donna. Loved this visit. I love all the photos…but I’m with some of the others I love the old country store with the old skool Pepsi sign. 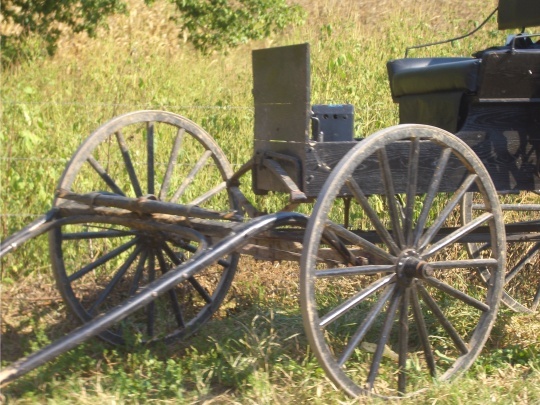 I miss not having a car these days (the Amish actually have one up on me technology wise with a buggy LOL) and being able to roadtrip on a warm spring weekend just going where the road takes you. I’ve always wanted to find Butcher Holler (Loretta Lynn’s girlhood home) in KY. I understand it’s quite hard to find, but it is well preserved and the scenery is gorgeous. I do wonder, if the Amish economic situation in the South is more tied to the fact that they live in a less prosperous area of the country than the fact they are Swartzendruber? I wonder how a NY or OH Swartzendruber settlement compares to one in TN or KY? 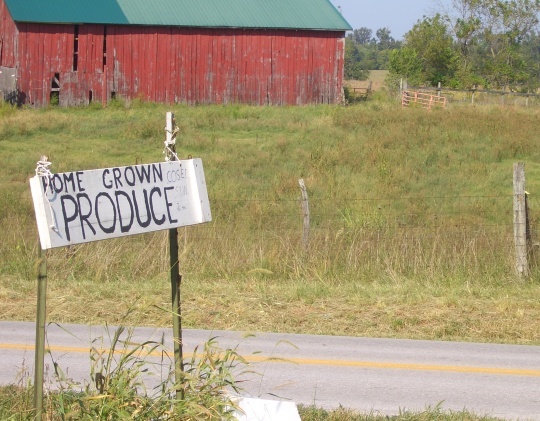 Lindsay; I would think that it has more to do with the fact that most of the more Southern Amish communities choose to focus more on farming and less on commercial interests. Although there may be more affluent parts of the country than the rural South, the cost of living is much less in the than in those other areas as well. I suspect that is the draw for most of the southward expansion of the Amish; the ability to buy things more cheaply than in other areas, especially land. I don’t think I am talking out of school or being disloyal to say that things in the more rural areas, especially in the South, are less “prosperous” than they are in the more urban and suburban areas … like much of the Northeast. Hi Viv, thanks for your interest! I’ve considered selling some, but haven’t quite gotten that off the ground yet (lot of projects right now!). I don’t mind sharing this one with you though. If you drop me an email I’ll send you a larger version of it. I believe one of the readers asked if you will sell your photos, great idea! Did you ever consider publishing a book of your photos? I’m sure many of us will purchase one! Thank you Erik for sending me a larger version of this picture. My brother in law loves old buildings with PEPSI signs on them. Let me know where I need to send my email address to you if you don’t get it this way. Thank you! Viv, I just sent you the photo, hope you enjoy it. I used the email you provided, let me know if it didn’t make it for some reason. I hope ypu can go ahead with publishing the book. 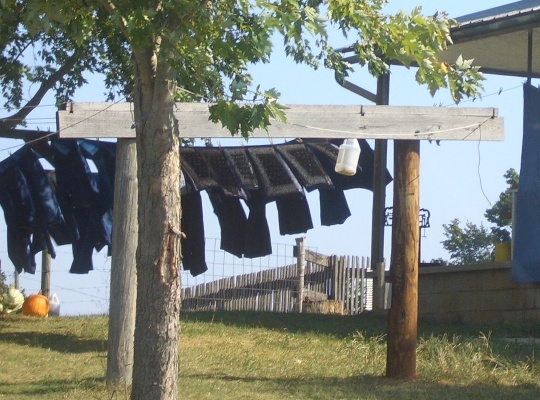 Amish photos are difficult to locate, even on ebay. I know, I have been trying to locate them through the years. On a rare occassion do I find one. Old buildings with old signs, such as Pepsi, and Coca Cola are hard to locate. 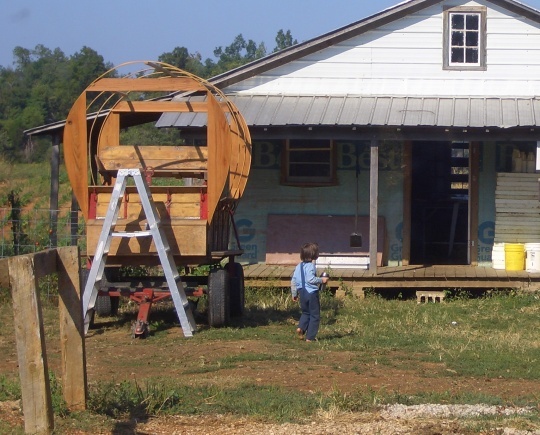 Like old barns, they are being destroyed in the name of “Progress”, i.e., greedy people who buy the land to sell it at a profit. Up to a certain point, I guess that’s ok. But, we should not destroy what never can be replaced and appeals to most people…So in the end Erik, you taking the photo of that building with the Pepsi sign, might one day turn out to be a classic, after the building is destroyed. I would certainly encourage you, when upon chance, you come across old buildings with old advertising signs, and old barns to proceed and take photos! I collect 35 mm slides from the 50-60s. Viewing them is looking through a window from the past. Buildings, houses, cars, barns, bridges. all destroyed. My thanks to all the amateur photographes who took those photos! Photos of Disneyland taken in the fifties and sixties commend premium prices due to all the changes at Disneyland. The point I am making, Erik, is, you’re doing a superb job with your photography; Keep up the good work! The comments of your readers about your photos are all positive. Many thanks George for this feedback. I do appreciate it. You have a good point about these items of yesteryear. I thoroughly enjoy coming across them as well. I’ll keep your advice in mind.